These sloppy joes have all the flavor of traditional cheesesteaks and none of the fat. 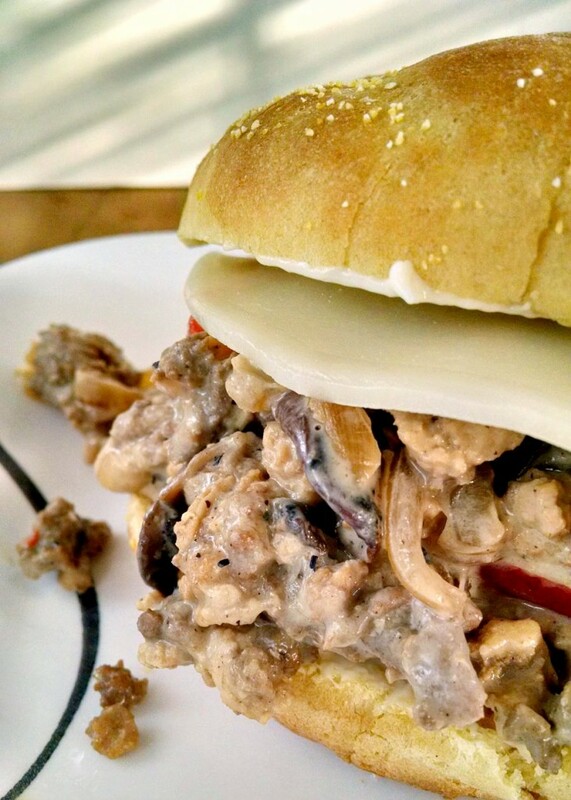 Turkey Cheesesteak Sloppy Joes will be your new fave weeknight meal! I know I’ve made some Philly Cheesesteak Sloppy Joes before. That was more of a recipe review. The original recipe is in the beginning of the post. While they were tasty, I wanted the creaminess of the Cheez Whiz/Provolone that you can get on a cheesesteak. So, I invented by own Cheesesteak Sloppy Joes recipe. Yeah. See how creamy it is? See how the meat, the peppers, and the onions are coated in creamy goodness? It tastes exactly like a cheesesteak should taste. At least how *I* think a cheesesteak should taste. And ya know what? This is healthy. It’s LOW FAT and crazy, tasty good!! The protein is lean, the veggies are plentiful, the cheese and it’s sauce are low in fat, and the bun is WHOLE GRAIN! Yup, healthy. I bet you didn’t know healthy could taste like this, didja? You will need a fork and LOTS of napkins for this one. Trust me. It’s just as messy as a cheesesteak. And it’s just as tasty as a cheesesteak. There’s the tasty meat (in this case ground turkey), the sweet peppers and onions, the hearty mushrooms all mixed into a creamy cheese sauce. Then it’s all topped with provolone cheese! Who doesn’t love more cheese?? And did I mention that this comes together in about 30 to 40 minutes? Oh yeah! It’s healthy, hearty, and QUICK! You can make this any night of the week and please even the pickiest of eaters! Add in some baked fries or the quick Easy Fries and you’ve got a kid pleasing meal for the little and big kids! You know you want to take a bite. Heck, I DO! That one, right there! A bite of meat, pepper, onion, mushroom, tasty bun. Yup! I’m grabbing a fork, some napkins and digging in! Heat a large skillet over medium-high heat. Add the peppers and onions and cook until they begin to soften, about 3 to 5 minutes. Add the mushrooms and cook an additional 4 minutes. Crumble the turkey into the peppers and onions and sauté until cooked through. Stir in the cream cheese, half and half, and Worcestershire sauce. Simmer until thickened. Divide the mixture evenly between 4 hamburger buns. Top with provolone cheese and broil until the cheese is brown and bubbly. Serve with Easy Fries and a lettuce wedge. *Count your rolls as 1 bread per ounce for a low fat roll (approximately 1.5g fat per serving or less). This looks amazing I was just thinking about making a cheesesteak wrap. This filling sounds amazing.